It is commonly accepted that B2Bs sell to accounts, not individuals. And yet traditional web analytics services fail to deliver B2Bs the kind of account-based visibility which is becoming critical to online success. What is of interest to the B2B marketer is not simply the online behavior of an individual, but also the organization he or she represents. 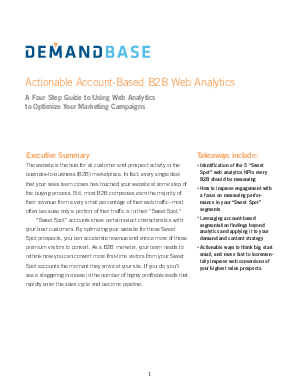 Download this white paper now for four actionable steps on how to make the most of your web analytics solution in B2B.